A couple of days ago I was playing around with a variation of my tried and true marinara recipe. I didn’t really have any particular purpose for the marinara but just felt a tugging compulsion to make some. So what does one do when one finds themselves with a pot full of wonderful sauce? 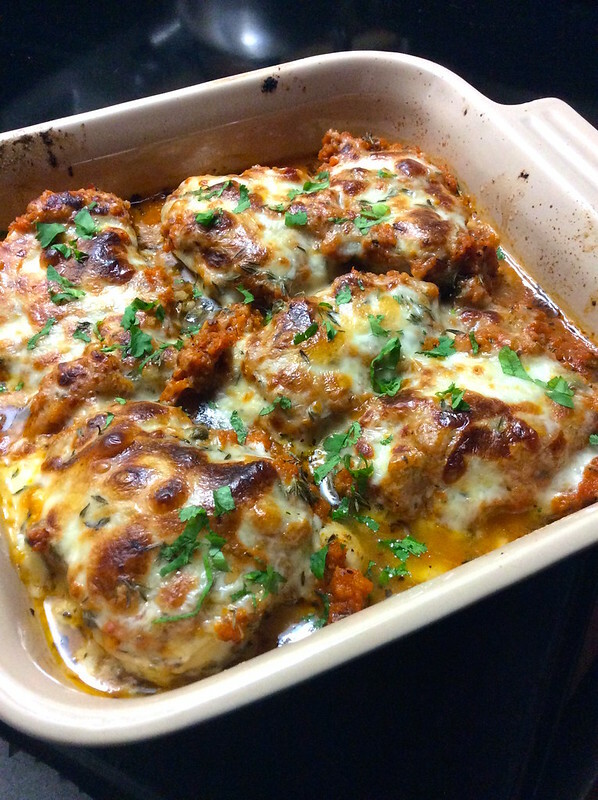 Make some Chicken Parmigiana, of course! It also may have helped that I was scrolling through IG while the sauce was simmering and saw a rich plate of Chicken Parmigiana that someone had posted. And since I hadn’t made some in a very long time, I decided to put my newly made marinara sauce to some delicious use. 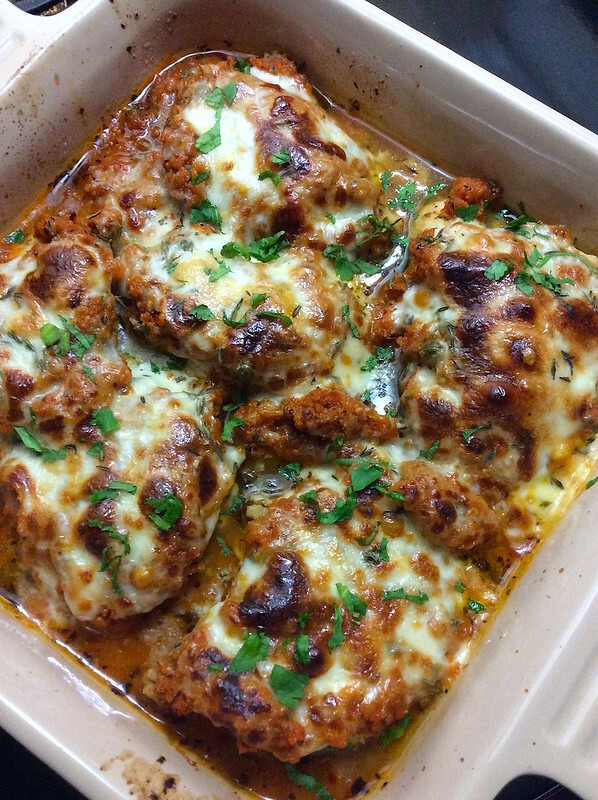 Chicken Parmigiana is typically breaded and pan fried. And although it’s delicious, that step does take some extra time and if you don’t serve it soon after it’s made, the crust can get soggy. Let’s face it–what’s the point of taking the extra effort to have a crispy crust/breading only to have it get all soggy? So I usually just skip it! I like to make a very simple and quick version of this Italian-American dish which makes it a perfect weeknight meal. After a quick browning in the skillet (since I nix the breading/frying), I smother the chicken in marinara (homemade or store bought) and cheese before it bakes for several minutes. The sauce seeps into the chicken while it finishes cooking in the oven so it’s wonderfully juicy and flavorful. Serve it alongside some pasta, potatoes, veggies or even in a sandwich and you’ll be all set! You can also make a very large dish/tray of it to serve during the holidays. Since there’s no crust, you won’t need to worry about it getting soggy. Using a kitchen mallet or bottom of a heavy pan, pound each of the chicken breasts to an even thickness. Place the chicken in a dish and add the onion powder, basil, fennel seeds, red pepper flakes, paprika, garlic, lemon juice and zest, ½ teaspoon kosher salt, ¼ teaspoon black pepper and 3 tablespoons olive oil. Flip the chicken around a few times to coat evenly. Heat a large heavy bottom skillet with 2 tablespoons olive oil. Cook the chicken breasts over medium-high heat until golden—about 2 minutes each side. Spread ½ cup marinara sauce on the bottom of a baking dish. 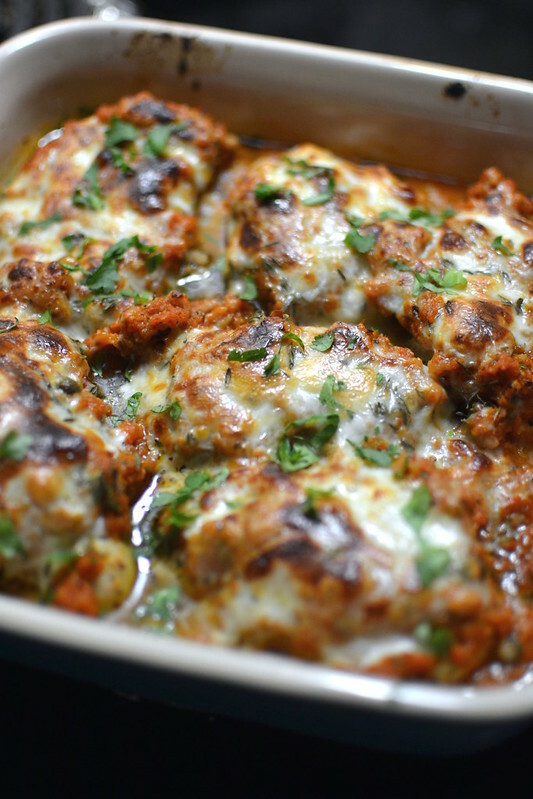 Place the browned chicken breasts in the dish and top each breast with the remaining marinara sauce. Top each breast with sliced mozzarella and parmesan. Bake for 7-8 minutes until the chicken has cooked through and the cheeses have melted and browned. If needed, turn on the broiler briefly to brown the cheese. Remove the dish from the oven and sprinkle the tops with chopped parsley. Serve warm. Next Post Jingle Bell Juice – Happy Holidays! I need fast supper fixes like this! Looks delicious!